Suddenly, at the Lennox and Addington County Hospital in Napanee on Thursday, December 20, 2018. 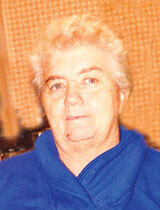 Dorothy May Tyner of Napanee at age 77. Beloved wife of the late Roy Tyner and dear mother of Brad (Pam) and Brian (Patti) and David (Tammy Harvey) all of Marlbank. Grandmother of Bradley; Wesley (Sylvia) and Lori Tyner (John); Roy “R.J.” (Jenn) and Brittany Tyner (Bryan). Great-grandmother of Madison; Allison; Hunter; Ashley; J.R; Nicholas; Isaac; Tyson; Ila and Brody. Sister of Doreen Huffman (late Tom) of Winnipeg; Gail Murray (Vince) of Picton; Wayne Brinklow (late Judy) of Bath; Terry Brinklow (Eilene) of Napanee and the late Garry Brinklow (Cathy of Napanee). Cremation has taken place, a graveside service will be held at Riverside Cemetery in Napanee, on Friday, January 4 at 11:00 a.m. Memorial donations made to the Heart and Stroke Foundation or the Ontario SPCA Lennox and Addington Branch would be appreciated by the family. In the care of Hannah Funeral Home, in Napanee.